On the off chance that the ending of Monday night’s Seahawks-Packers game wasn’t crazy enough for you, here’s something that makes the whole story a little bit nuttier. Mike Silver of Yahoo! Sports, who had an onscreen cameo in the chaotic aftermath of the officials’ decision to give Golden Tate a touchdown on the final play of the game, reports that Seahawks quarterback Russell Wilson actually called the wrong play in the huddle before the officiating decision heard around the world. Wilson called a Waggle play, calling for some of his receivers to run short underneath routes while he rolled out to his right on a play that began with eight seconds left on the clock. Some of the Seahawks ran the play Wilson called while others, including Tate and Charly Martin, went to the end zone to run the play that Wilson was supposed to call. It all wound up working out for the Seahawks, obviously, but it adds another surreal layer to everything that unfolded on the field in Seattle late on Monday night. Silver’s piece on the game also includes a vignette with Seahawks running back Marshawn Lynch and family watching the replay of the final play at a restaurant in Seattle after the game. Silver says he could see Lynch’s jaw drop as he watched it unfurl and that Lynch “almost apologetically” spoke to Packers fans outside the restaurant after watching the play. Lynch is absolutely correct. If things had played out differently, though, Wilson might have had something to apologize for on Tuesday. Only RGIII and Wilson will have successful careers from the 2012 draft. If the NFL has any integrity left they will just admit that a mistake was made rather than waste our time trying to justify a clearly errant call. You can pee in my cereal, but just don’t tell me its milk. How did the receivers run the right route if the QB called the wrong play? This doesn’t even come close to evening things up with all the favorable calls GB has gotten at lambeau over the last umpteen years. I’m LOVIN’ it!!!!!!!!!! We finally have no favoritism in the reffing ranks! Seahawks won the game fair and square. I’m sick of hearing the Packers whine about this. The media and cheesheads need to stop crying as well, because lets be real, if this happened to the Jaguars or Buccaneers we would not be having this “travesty” heaped upon us by the media. Let’s be clear on this: The right call was made. End of story. The rules state that if both offense and defense are in possesion of the ball the tie goes to the offense. Now I agree that the Packer defender outleaped Tate and secured the ball in his hands first. BUT THE PLAY DOESN’T END THERE. Before the defenders feet hit the ground, it’s clear that Tate has his hands on the ball too, and they continue to the ground that way. Just because the defender had his hands on the ball first doesnt mean anything, he still has to MAINTAIN POSSESION, just like a receiver would have to. If a receiver catches a ball in the air, he still has to MAINTAIN POSSESION until his feet land inbounds. I agree Lynch, you dont have nothing to apolgize for. But everybody still knows ya’ll benifited from one of the worst calls in NFL history and your “Win” will be forever tainted. What makes you think that? Their 1-2 records or their unfledged nack for making believers out of doubters? Josh Alper, your headline is wrong. It wasn’t a Tate catch, not even close. The ref should be investigated for ties to organized crime, jus’ sayin’… Millions of dollars changed hands on a terrible call. Did you also not notice the flagrant offensive pass interference by Tate before the ball got there? He shoved a Packer to the ground a half second before the ball arrived. You wrote that entire article without even mentioning the name of the Packers player who really caught the ball? Which team HASN’T been the victim of a questionable call? I still don’t see why Hawk fans think Russell Wilson is all that. He’s forever abandoning the pocket prematurely and then wanting to roll out to his right. It’s like he’s been programmed to do just that and only that. If Green Bay had an offensive line, they wouldn’t need the refs to bail them out at the end of the game. Hail Mary Defense= Make sure no one can make a play on the ball. A swat is what Jennings should have done.Even if it were a “tie” in the catch, the posession always goes to the receiver. The Packers got beat by a rookie 3rd-round pick. Coach em up Packers. How many times did the wonder boy get sacked? If they would have had many lambeau leaps last night we would not be talking about this. You played awful, so go and practice to work on protecting your QB. Move on Cheesehead fans. You will have a lost by the Hawks, make no mistake about it. “Coach em up Packers. How many times did the wonder boy get sacked? If they would have had many lambeau leaps last night we would not be talking about this. no mention on how good the packers defense played for the exception of 1 play (PA TD pass) … They were robbed of 2 Interceptions that would’ve sealed the game in the 4th qt… smh how anyone can stand by such a robbery and call themselves sports fans. I can understand the hatred for the Packers, but don’t let your hatred blind you from the reality of such an egregious call. But here’s the thing: The call the refs really fudged was the unnecessary roughness hit on Wilson that reversed the interception. Yes, it may very well go down as the most notorious week three interdivision showdowns between 1-1 NFC teams of all time. In all seriousness, I actually agree with everything you’re saying, I just don’t think anybody will have more than a faint recollection of this game by April 2013. Unless that is, it costs Goodell his job (crossing my fingers). I hate the Packers more than any other NFL team, but that was the wrong call. You bring up the rule that if both the receiver and defender have possession of the ball then possession goes to the offense, that is correct. The offensive player did not share possession of the ball it was against the defender’s chest and he had both hands around it and landed in bounds and went to the ground with it. The offensive player had to readjust his hands as was shown on the replay to get a better grip to try to rip it away from the defender. I don’t even care that Tate pushed off pretty badly, that happens a lot on both sides on a hail mary. I laughed all last night, because nothing makes me happier than see Packers fans upset, but to say the correct call was made is pretty stupid. Judging by your name being Kathy, I’d also say it plays right into the stereotype that women don’t know jack about sports. Except for the blatant pass interference, Lynch is right. Yeah, It was a terrible call but it was just the final call of a horribly officiated game. Really, had the game been well called I honestly have no idea who would have won!! As it stands GB did get jobbed. However, those with longer memories remember good old Phil Luckett jobbin’ Seattle on more than one occasion… It is not like the regular officials have never stepped in it!! Like we Hawk fans were told after SB 40… It was incumbent upon the Seahawks to not let the officials decide the outcome… I agreed with that position then and I still do..If you want to prevail, sometimes you have to beat the officiating as well as the opponent. Nothin’ new. Your point is valid about the simultaneous possession. That call was not the right call though. Tate should have been called for that blatant pass interference. I don’t know how two refs in the end zone right by the players missed that call. You stated the defender had to maintain possession as the reason you agree with the call and he did. To MAINTAIN POSSESION don’t you have to have first you know posses the ball? The ball was in the defender’s arms tightly against his body from the catch until the end. Tate had one hand on the ball and didn’t get the second one firmly on until well after the defender had established possession. So if this story is accurate, maybe we should pump the brakes on all of the Russell Wilson is so far ahead of the rookie learning curve stories that are about to be written, and how he’s just a ‘winner.’ The facts are he beat out a career back-up, and has had less than stellar production in 3 starts. Lets let the guy do something before making any serious predictions. Everyone is asking how can u stand by this robery and call urself sports fans? What do u want us to do? Its not the seahawks fault? Its not greenbays fault? It was the refs and nfls fault? Im not gonna stop watching because of their blunder. Everyone just needs to chill and relax we have all seen terrible calls before. I bet everyone of our teams have been victum to a horrible call before? 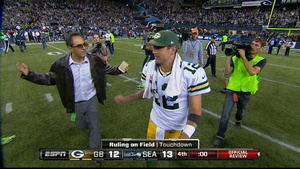 If the rolls were reversed last nite it would be the hawks mad and greenbay all happy. People theres nothing we can do about it . Time to move on. Besides this whole thing has taken away from a pretty good defensive performance by both teams. The calls down the stretch were terrible. Granted, the way the Packers played the first half they didn’t deserve to win. Also, the Seahawks have a great defense. But the last drive was ridiculous. The roughing the passer penalty on the interception was VERY questionable. Then, the Seahawks had First and 38 and the refs called interference on the defense when it clearly should have been on the Seahawks. On the last play, a Packer fan can live with the fact that they blew the Off. Pass Interference. However, the catch was NOT SIMULTANEOUS Possession. The Packer clearly had both hands on the ball first which would mean it wasn’t simultaneous. The Seahawk player was basically just hugging the Packer player and the ball. Horrible call.